Manchester United have entered the race to sign Ajax sensation Frenkie de Jong, as per reports in the Netherlands. The versatile talent, who can play as a central midfielder as well as a centre-back, has been attracting heavy interest from all over Europe since the previous campaign. He was heavily linked with a move to Barcelona and Manchester City in the summer of 2018, but no switch materialised, as the 21-year-old decided to stay put and continue his development in Amsterdam. Now, according to Dutch newspaper De Telegraaf (via Metro), the two aforementioned clubs’ respective arch-rivals, Real Madrid and Manchester United, have also begun pursuing the Holland international’s services. The Eredivisie giants have set a £71.5m price tag on their prized asset, but with such juggernauts of European football expressing their interests in the player, Ajax’s director of football, Marc Overmars, is already said to be “licking his lips” over the prospective bidding war. The report states that Real Madrid are prepared to match Ajax’s high asking price, as the Galacticos view the youngster as the perfect long-term replacement for their midfield maestro, Luka Modric. But now, with Manchester United having entered the fray, the Red Devils are said to be more than ready to match Los Blancos’ offer and steal the Dutchman from right under Real’s noses. De Jong already has 2 international caps to his name at such a young age, whilst also boasting the best passing accuracy at Ajax, and the highest number of average passes (84) per 90 minutes in the whole of Eredivisie. Naturally, apart from the English and Spanish powerhouses, Ligue 1 champions Paris Saint-Germain and Bundesliga holders Bayern Munich have also been impressed by the midfielder, which makes a continental bidding war all but imminent. 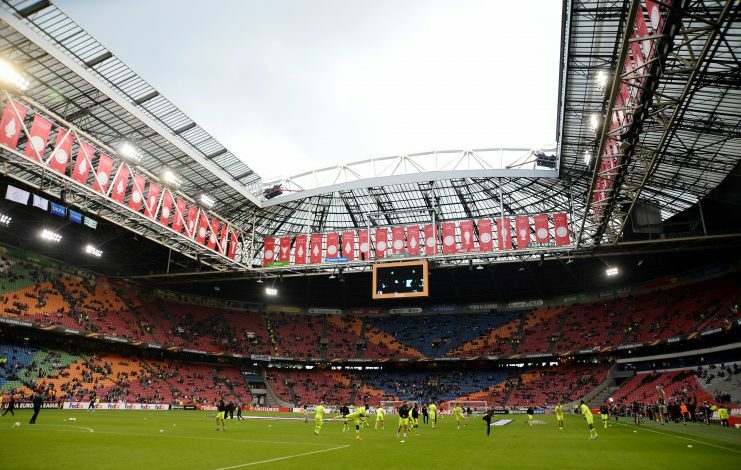 With Ajax sensibly aware that they will have to let their player join a bigger club in the future, a blockbuster transfer window can be expected as early as the upcoming summer of 2019. Where do you think De Jong will end up?